Looking for traditional Pakistani Party dresses? 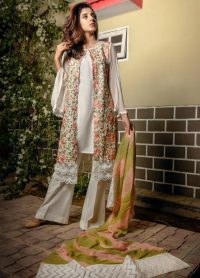 Exclusive’s Bold butterfly colors and flowing fabrics make Pakistani Party Dresses just a bit more fun than a plain old dresses. 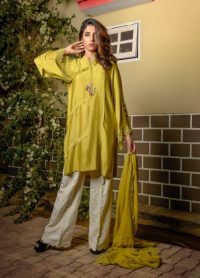 Adding a little Pakistani Designers glam to your wardrobe is super simple with the large selection of Pakistani Party Dresses. Exclusive Pakistani Party Dresses are a great option for an unpretentious, comfortable yet stylish look. Straight shirt with cigar trousers come in beautiful party wear varieties which can add a dash of Pakistani charm to any event. Moreover with flattering and in-vogue silhouettes like the Anarkali suit, a high glamour quotient is guaranteed. At the same time, the floral patterns and colorful but subtle embroidery and embellishments also make for great Pakistani Party Dresses. So starts finding the awesome and flawless design parties dresses in our new collection right now and turn yourself to be attractive looking for others. A party calls for a celebration. Celebrations are for a special reason, such as an achievement or a special memory that is to be cherished. Going to a party soon? Well, you have to be dressed elegantly to be in the spotlight. Exclusive Inn offers a range of Pakistani Designer Party Dresses online for your fashion desires. Our online Pakistani Party Dresses collection are carefully designed by experts keeping you in mind. We know how hard it is to impress others with your dressing sense and just a little bit of something odd can look very bad, especially when it comes to your party dress.We follow the latest fashion trends so you don’t have to try and keep up. Looking for designer long and over coat style dresses? Exclusive Inn’s party dresses collection holds some of the best designs you will find in the market! We’ll be proud to serve your party wear needs.